Sister of Providence Arrianne Whittaker, 31, admits the love she feels for her sisters in community is everlasting. “I have discovered parts of myself that previously were unknown to me, I have been challenged to embrace transformation and trust in the process,” she said. And she has learned to embrace her fear of change throughout this process as well. 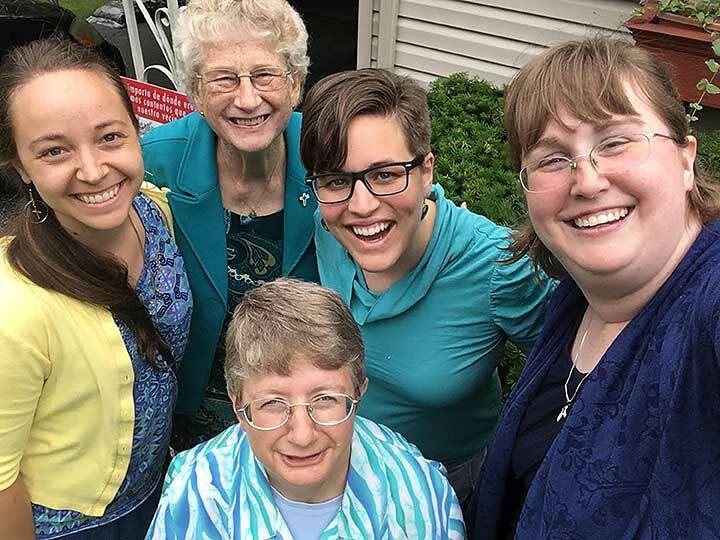 Sister Arrianne Whittaker (far right) takes a selfie with fellow Sisters of Providence (clockwise, from left) Tracey Horan, Jenny Howard, Emily TeKolste and Patty Wallace. 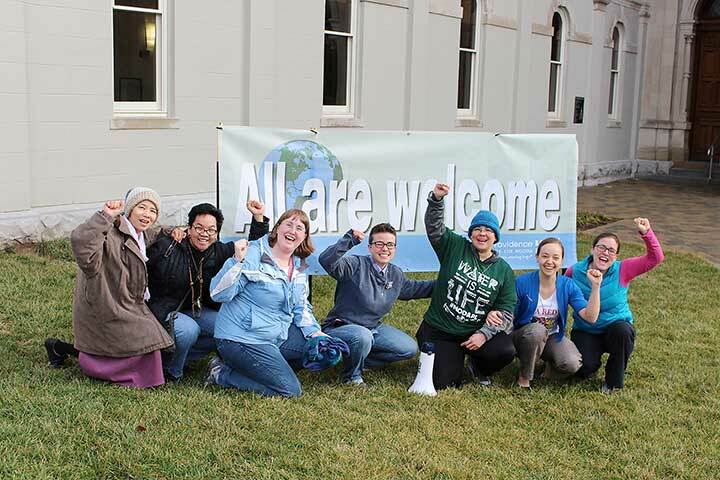 Sister Arrianne’s journey to Saint Mary-of-the-Woods, Indiana, and the Community of the Sisters of Providence began after she volunteered for one year with the Congregation after graduating from Marquette University in 2009. She had plans to go to medical school the following year, but those plans were delayed. “I felt a kinship with the spirit of the Woods, and certainly grew to love Mother Theodore as the sisters do,” Sister Arrianne said. Sister Arrianne said at the time, volunteers at the Woods all lived together and apart from the Congregation. However, unforeseen circumstances forced the volunteers to move into a residence hall with the sisters. Following her year of volunteerism, Sister Arrianne went to a dinner with then Sisters of Providence Vocation Director Sister Jenny Howard, who directly asked how she felt about the Congregation and a possible vocation. While her journey to the Community had some twists and turns, she knew where her heart was taking her. Sister Arrianne Whittaker (third from left) with Sisters of Providence (from left) Anna Fan, Dina Bato, Corbin Hannah, Joni Luna, Tracey Horan and Emily TeKolste outside of the Church of the Immaculate Conception at Saint Mary-of-the-Woods. She completed the transition and her journey moved forward, as Sister Arrianne officially entered the Congregation on Jan. 4, 2012. Even though she has become a woman religious, Sister Arrianne never gave up her desire to become a doctor. After engaging her sisters and other strong confidants, she was encouraged that she did not have to give up that dream. She could do both. She is now entering her fourth year of medical school. 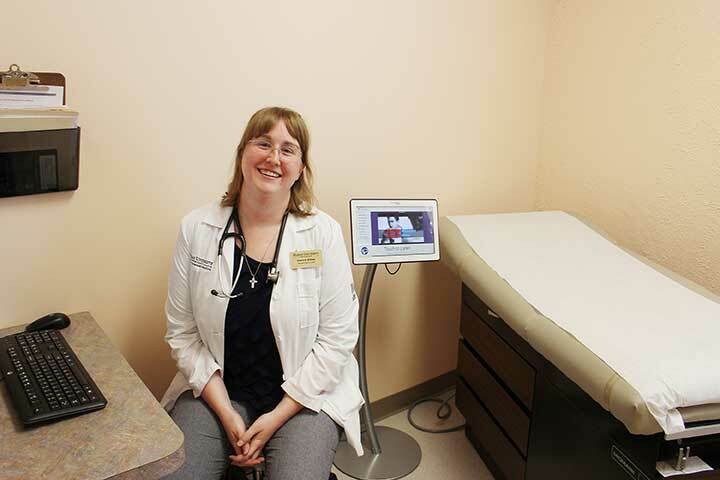 She hopes to someday work in family practice, possibly in a rural community. “I hope that my work brings God’s Providence to all whom I serve in this world,” she said.